I am writing this piece in the hopes of bringing clarity to what I find to be some common misunderstandings about the Amish. There are many different and varying opinions about Amish beliefs, practices, and customs. This article assumes that the reader already has at least a basic understanding of who the Amish are. Among the most unifying aspects of Amish life are the use of horse and buggies for transportation, plain dress, a simple lifestyle, the necessity of forgiveness for all, non-violence, Pennsylvania Dutch as a common language, community focus, a good work ethic, no connections to the electric grid, and acceptance of The Dordrecht Confession of Faith. 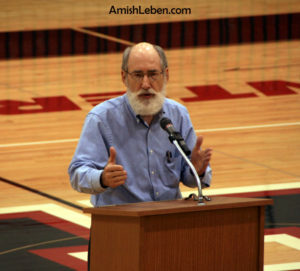 Don talked about the increasingly diverse world of the Amish. With more than forty Amish settlements, spread across more than half the U.S. states, ranging from ultra-conservative to liberal, each with their oral traditions, he said “There are a thousand ways to be Amish.” As an affirmation of the truth of this statement, a chuckle spread through the crowd of mostly Amish. Many of the variations in practice among the Amish are dependent upon the affiliation they belong to, geographical location, whether or not they have been baptized and are church members, oral church district regulations (The Ordnung), family preferences, and individual preferences. With the growing diversity within Amish culture, it is becoming increasingly difficult to make broad, sweeping statements about the Amish. For the purpose of this short article, I won’t delve into a lengthy discourse about who, what, why, and where but will give some specific examples of some of our reader’s statements about the Amish. “The Amish wear plain, dark-colored clothing.” There are Amish affiliations who allow the wearing of plain, but bright clothing. Many Amish young people who have not been baptized into the church wear “English” (non-Amish) clothes. I’ve had people insist that because of the look of their head coverings or bright colored clothing they can’t be Amish; they must be Mennonites. “The Amish don’t have electricity.” Some of the most conservative affiliations use no electricity, not even batteries. Many affiliations have electricity via batteries, generators, and solar power. I know of a liberal affiliation that allows connectivity to the electric grid, though this is quite rare. “The Amish don’t have cell phones.” Years ago, many of the Amish affiliations allowed telephones in a small wooden booth located outside their home, usually near the end of their driveway. While this is still the case today, there are also Amish that have cell phones. Many of them use them on a limited basis, but some use them quite regularly. “The Amish don’t allow their photos to be taken.” The stigma against photos is still strong in the most conservative affiliations, while it’s much less of an issue in more liberal circles. There are now tens of thousands of photos of Amish people online, in magazines, calendars, books, and other media. Most of these are of Amish folks in public settings. Many of the younger generation of Amish are growing up with cell phones and smartphones and make use of the built in camera and video. In certain gatherings where mostly Amish are present, I will ask about taking pictures. Often I am told that it’s ok but “just be discreet about it”. Amish young people often give me the go ahead to take their picture. A lot of the Amish children love to have their picture taken and then they’ll want to see the picture. Frequently I give reprints to Amish parents of their children. In general, taking pics is much less of an issue for young people and children who have not yet joined the church. Even so, I have had Amish adults give me permission to photograph and even video them at work. Generally speaking, most adult Amish will not “pose” for a picture. “The Amish meet in homes for their Sunday church meetings.” Most do but there are exceptions. In Pinecraft, Florida, the Amish have church services in a community building. There are no large homes or farmsteads for them to meet in like there are in Ohio, Pennsylvania, and Indiana. There is a new order Amish settlement in St. Ignatius, Montana that holds their church service in their combination community/school building; the same goes for an Old Order Amish settlement in Manton, Michigan. “The Amish don’t drive automobiles.” This is a tough one. While this is almost universally true, there might be one exception, the Beachy Amish, who drive dark colored cars. I know some Beachy Amish who refer to themselves as being an “Amish man”. Some would argue that they are not Amish but conservative Mennonite. If they want to be called Amish, so be it. “The Amish only use horses to do work in their fields.” Not anymore, some Amish use tractors without rubber tires and some use tractors with rubber tires. 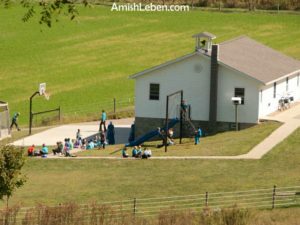 “Amish children go to Amish private schools.” In addition to Amish schools, there are Amish in the Holmes County, Ohio Amish settlement who are home-schooled and some who go to public schools. An Amish school house in Holmes County, Ohio. “Amish children only attend school through the eighth grade.” There are now Amish children whose parents encourage them to go to a special post-middle-school, complete the ninth (and sometimes tenth) grade, and get their GED certificate (high school equivalency certificate). These schools are vocational in nature focusing not on general studies but in the development of specific skillsets such as accounting and bookkeeping, typing, clerical functions, computer literacy, and other courses. There you have it. I could give a lot more examples but I think you get the picture!